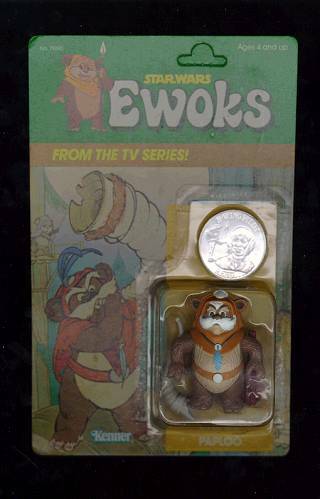 This is about as close as it comes to a full-production example of a second series Ewoks figure. A few of these carded samples popped up a few years back and have since filtered through the collector's market, attaining a certain degree of notoriety in the process. As you can see, the quality is fairly high-gloss, with little aside from the incongruous B-Wing Pilot coin to betray its identity as a pre-production item. The figure itself is a fully finished, ready-to-market product, with date and copyright markings and what appears to be a machine-applied paint job. The card is also the correct Paploo design (many of these carded samples are on incongruous backer cards) and the bubble even has the correct insert, perfectly formed to this specific figure's body contour. Examples of these second series Droids and Ewoks figures exist both in first shot and hardcopy form, but holding something this fully-realized in your hands--something that almost seems as if it were bought in a toy store--produces a marked feeling of disorientation.